The Chevrolet Volt is an important trendsetter as the first mainstream model to establish the plug-in hybrid segment as a viable answer to long-range EV driving. That same segment it created, however, is now bursting with new entries three years after the Chevy first hit showrooms. The Volt shows how far the level of technical knowledge has come in just a few short years, as the latest models have little difficulty topping the Volt’s MPGe scores and do so with conventional three-man back seats and traditional trunks for luggage. At the time of the Volt’s development, its Chevrolet Cruze-based platform could only accommodate the giant T-shaped li-ion battery pack if it was laid out under the center console and back seat bases – creating a cockpit much tighter than most are willing to accept in a $35,000-plus new car. Therein was the Volt’s other major critique at launch: prices that mean buyers could afford almost two fleet-spec Priuses for the price of one loaded Volt. Luckily, time has caught up with the Volt’s technology and the pricing of competition from the Honda Accord Plug-in Hybrid, Toyota Prius Plug-in and Ford Fusion Energi. The Accord PHEV and Fusion Energi are both actually a bit more expensive than the Chevy, but can deliver a quicker and more-efficient drive while making fewer interior compromises. For 2014, the Volt gets a (very slightly) larger-capacity battery pack, detail trim and color changes, and a simpler opening mechanism for the EV charge door on the front fender. 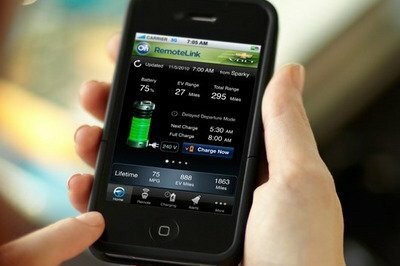 Where does the Volt fit in today’s eco-confused market? 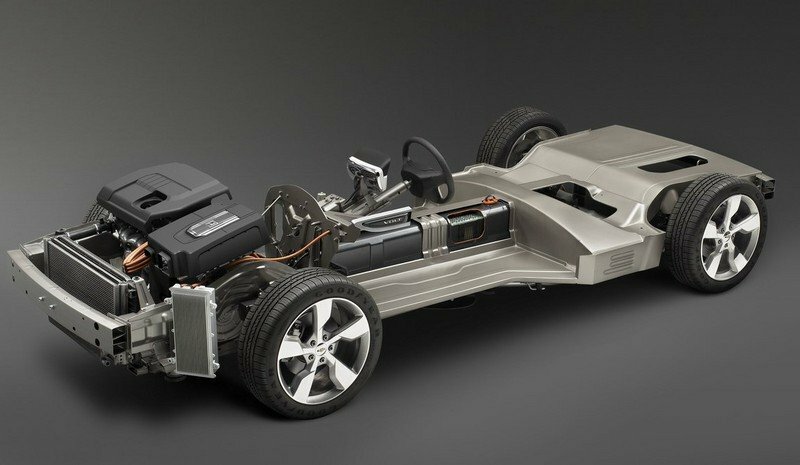 Does its battery-plus-generator powertrain still rank as a world-beating first or more of a barrier to purchase among buyers who need a big trunk and seating room? Click past the jump for the full review of the 2014 Chevrolet Volt, with highlights on how its interior room, efficiency and performance rank versus the much-newer competition. The exterior design of the Volt has always been a wide miss for most consumers, despite some techy design elements and functional aerodynamic enhancements. The biggest problem for the production Chevy Volt was, in fact, the striking design and rear-drive proportions of the original Volt concept car. Where that car had a distinctly long hood-to-axle ratio, the production model lost all of the concept’s elegance. In fact, the cars are so different that only the power of the Volt name carried through to production. Short-wheelbase and front-drive proportions instantly show the Volt as an economy car, while the blocked-off upper grille area tries too hard to look like a regular air intake of the Chevy bow-tie face. Things get worse in profile and from the rear. The Volt’s profile is extremely awkward with a gloss black faux window-line running inches below the full length of the actual glass. This is a misguided styling nod to the original concept’s high-shoulder design and slim window graphics. It just looks odd and cheap on the road. The gloss black trim panel extends forward into the front fenders with Volt badging on both sides. This area was the charge door port of the concept, but made it to production despite large round doors serving for charging and fuel needs. The pointed black spear is especially bizarre because it could have been rounded off to make a smooth front window-line that also disguises the black side-mirror stalks. In back, the tail is faithful to the Prius-style hybrid silhouette archetype with a flowing roof glass that also opens up as the cargo hatch. Linear aerodynamic spats appear on the rear corners of the car and the high-mounted LED taillights are certainly modern versus the rest of the Chevy lineup. A center-mounted white reverse light lives in the lower bumper but fails to disguise the extremely thick bumper and trunk surfaces. A body-color roof and trunk panel were new last year, replacing the gloss black roof and lower trunk panels with painted surfaces. Overall, the Volt is a mismatched clump of styling themes that do not get along well together. LED running lights in the top corners of the headlamps help give the Volt a unique signature, and the low roofline shows off how smoothly air can pass by the Chevy. Unfortunately, these highlights are not enough to make the Volt’s looks a selling point on their own. 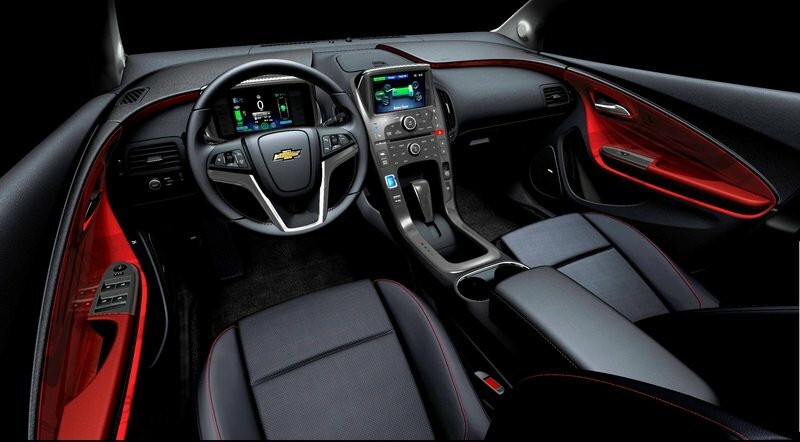 The interior of the Volt is a fantastic and futuristic expression of technology, and remains one of the most stylish from Chevrolet models in recent decades. Additional glossy plastic colors add some coolness to the doors and trim colors and look great with both the Apple-inspired white center stack or the dark charcoal-colored stack. 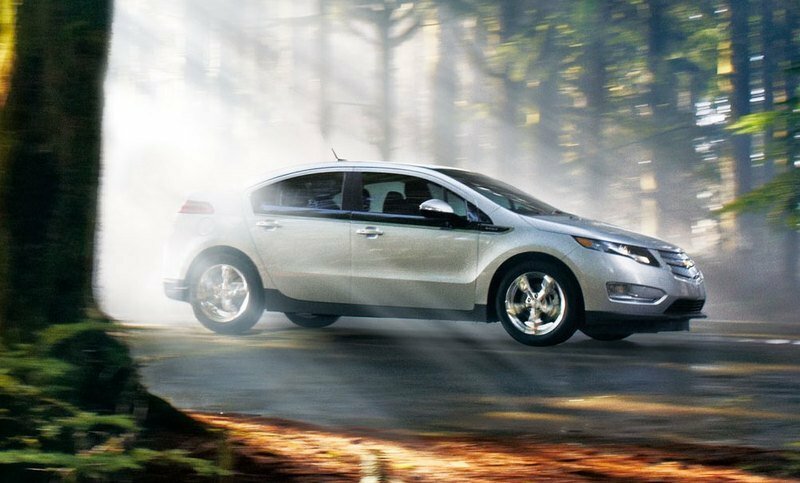 The Volt stands apart versus all other General Motors vehicles as the first to use electrostatic switches and buttons. These controls register clicks and taps without a separate button piece that needs to move in and out. Braille-style bumps let drivers know where to press, but it can still be a learning experience for new passengers. Twin square displays are both high-mounted in the dashboard to provide the main gauge cluster displays as well as the touchscreen-controlled central infotainment unit. The Volt’s tight interior dimensions are most noticeable in front/rear headroom measurements as well as rear legroom and hip room – all of which tighter than many compacts. The trunk does better with a total of 10.6 cubic-feet behind the rear seats, and more than double that with the two rear seatbacks folded. 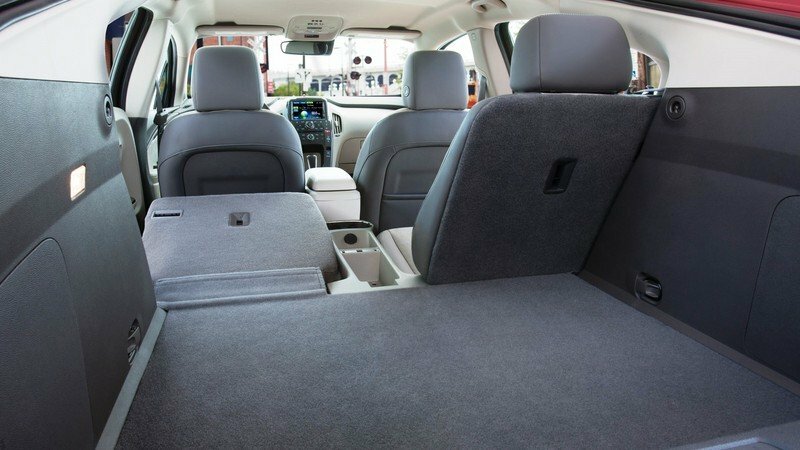 The cargo area is a good shape but is let down by the flimsy cargo cover that can cause bags to overflow into the opening between the twin rear seats. A dealer-installed panel can correct this issue. The big news for the Volt’s 2014 powertrain is a bump in total battery power from 16.5 kWh up to 17 kWh, increasing the max EV range from 35 miles up to 38 miles. It is a detail tweak that reflects the latest battery technology with more energy density in the same size package. The larger pack does not weigh any more or take up more room, so it is all benefit with no downside. The Volt’s original promise was to be a full EV drive with gasoline generator backup. In practice, this design did not work in all scenarios – such as a long mountain incline – where the generator could not provide enough power to keep the vehicle moving under EV power. In scenarios like this, the Volt brings gasoline power directly to the wheels via a multi-mode electric transaxle driving the front wheels. The distinction is not important to most shoppers but shows that some fundamental problems arose during the Volt’s development. Adding in gasoline power for high-demand scenarios defeats some of the engineering merit of the system, but it causes a bigger problem in total weight and interior packaging problems, as discussed above. The gasoline assist was a late addition to the Volt program and means most of its battery, generator and inverter hardware and software is larger and heavier than it needs to be. The competition has no qualms blending gasoline power with EV juice for the Accord PHEV or Fusion Energi – and these models spank the Volt with mpg-equivalent scores that are each well above 100, versus the Volt’s all-electric score of 98 MPGe. On gasoline power only, the Volt turns in a 35 mpg rating in the city and 40 mpg on the highway. An ultra-low center of gravity helps the Volt feel as nimble as its lighter Chevrolet Cruze sibling, but overall weight and electric power can offer only an 8.7-second 0-to-60 mph time and a 100 mph (limited) top speed. 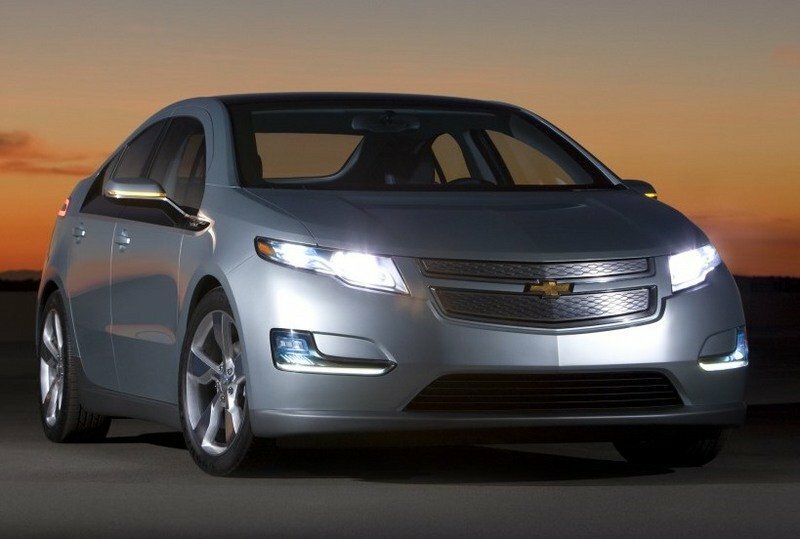 The Volt is an IIHS Top Safety Pick for 2013 and a top-rated car from the NHTSA. Original testing procedures caused a mild controversy because the crashed Volt’s batteries started to smolder three weeks after the crash test took place. This was determined not to pose a safety risk to consumers who would not typically leave a crashed Volt in an open parking lot. There have been very, very few cases where any Volt has ever caught fire during normal driving and charging and none where the Chevy was ruled to be at fault. This is in bold-face contrast to the charging and exhaust heat fires that plagued and eventually bankrupted the Fisker Karma. 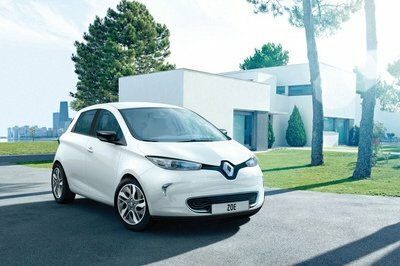 Mild software tweaks for 2013 brought an updated drive logic program to limit the rare chance of stalling when transitioning among EV, gasoline and hybrid modes. We had initially assumed that the Volt would carry over its 2013 pricing or maybe even see a slight price hike, but that’s not the case. 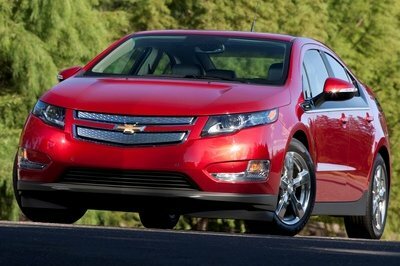 Chevrolet has just released that the 2014 Volt will start at $34,995 — a $5,000 price cut — plus an $810 destination fee. With the federal tax credit, the Volt could come in as low as $27,495. The Volt needs premium fuel but finally gained California and New York Carpool Lane (HOV) access for 2013, a real selling point in the traffic-clogged markets. The Prius Plug-in basically stomps the Volt in most efficiency measures, despite its older Hybrid Synergy Drive technology and low-enthusiasm driving style. A smaller battery limits the Prius PHEV’s max EV range but the Toyota’s much-slipperier drag coefficient and light curb weight mean it can nearly double the Volt’s 400-mile total max range. 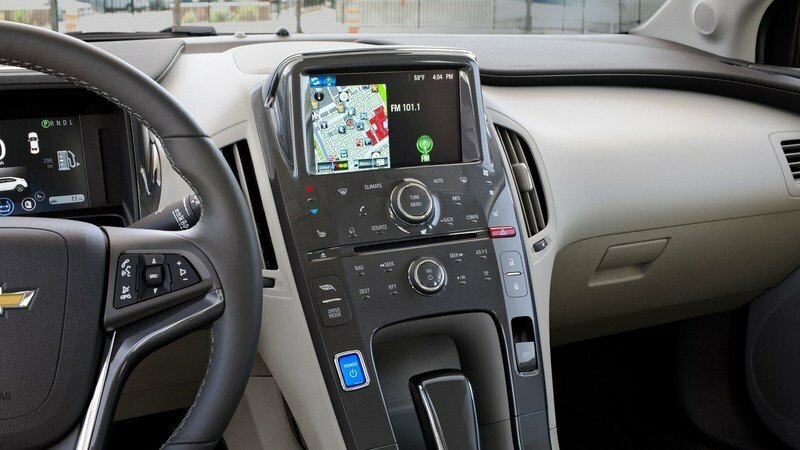 The Prius PHEV loses ground in terms of interior quality and comfort, where the Volt is much calmer in urban driving. 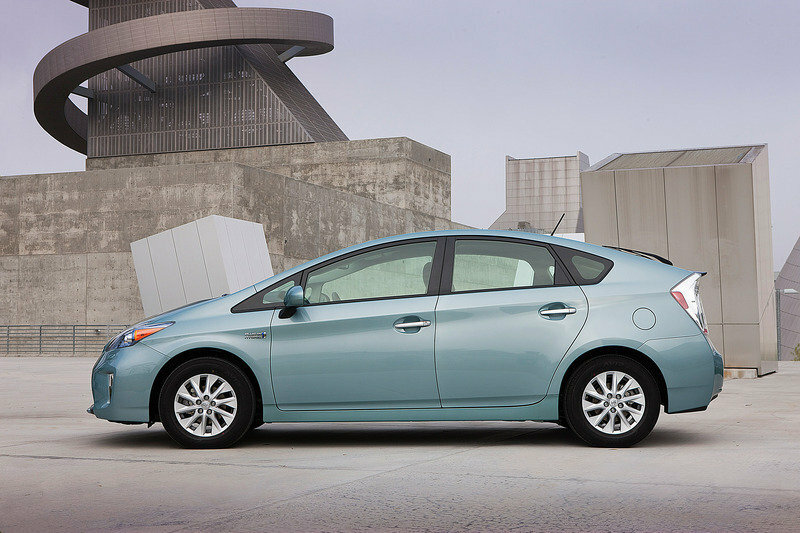 Prius PHEV prices range from $33,000 up to $38,000 for the Advanced package that many buyers will consider a necessity. The Ford Fusion Energi is also a plug-in hybrid model running advanced lithium-ion batteries that can be charged via a wall plug for a combined 100 MPGe score (when charged). This narrowly beats the Volt but does so in a much more handsome package that is both quicker and much larger inside than the Chevy. The Fusion Energi’s base price is $38,000 but offers similar levels of heavy discounting. Three years after its arrival, the Volt is comprehensively outgunned by the latest entries from Ford and Toyota. The Volt’s EV hype actually really hurts the car’s prospects versus conventional plug-in hybrid sedans. Selling the car as an electric vehicle, as Chevy continues to do, drastically limits the total size of the market for the Volt. Perhaps this would not be the case of buyers actually liked the idea of an EV-only layout. As of yet, the resounding answer from mainstream shoppers is that electric vehicles are too expensive and compromised to earn much attention. Unfortunately, the Volt’s whole business case relies on the car being a fashionable EV with a high-tech cockpit - and pricing to reflect that premium position. 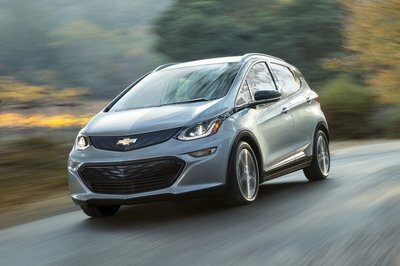 The long, long list of unique Volt components inevitably means it has priced itself right out of the running for most Chevrolet buyers. Would the story be different if the Volt shared any styling with the Cruze? 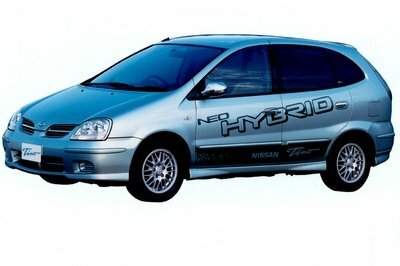 It would still be a very small and heavy car whose mileage is fully dependent on a wall charge. If this change could lop $10,000 off the Volt’s price, however, its fortunes would surely be improved. As it stands for 2014, the Volt is a niche choice but one that will make a lucky few people very happy. The Volt’s sales battery still has plenty of juice to surprise and delight buyers with its mileage, interior technology and smooth road manners. 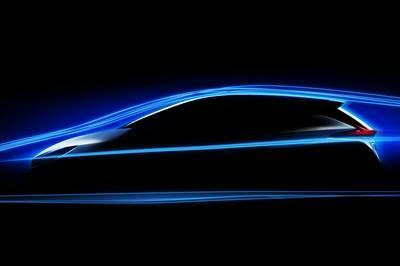 The Chevrolet Volt has established an entirely new segment in the global automotive market. It is a five-door, four-passenger car designed to provide the fuel-saving and emissions-reducing benefits of an electric vehicle without the range limitations associated with all-electric vehicles. With numerous awards that include prestigious North American Car of the Year and European Car of the Year honors – as well as a loyal and passionate customer base – the innovative Volt is bringing new customers into Chevrolet dealerships. 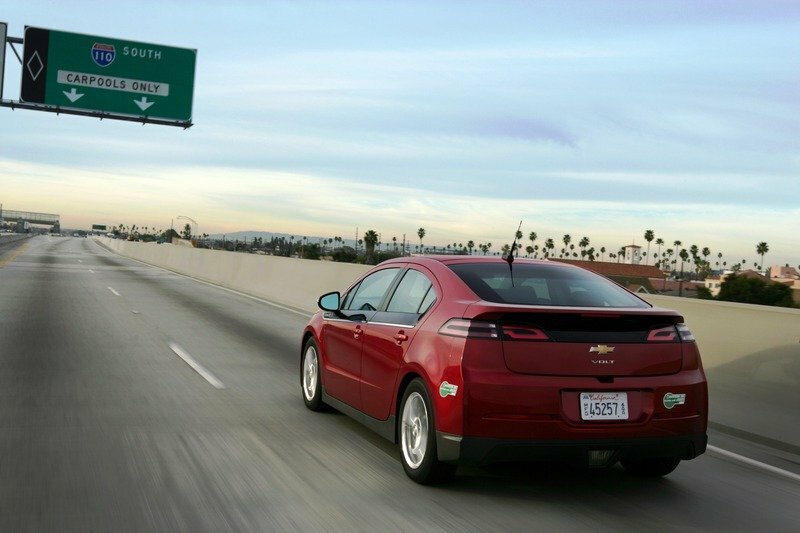 The Volt offers an e-AT-PZEV specification that earns the Volt a coveted “green sticker” for single-occupancy HOV lane access in California and New York. Volt also adds a Hold mode that allows owners to direct when the Volt uses its gas generator. This feature helps save money because owners who mix city and highway driving can save the battery charge for city travel, where the Volt’s EV mode operates most efficiently. Other updates include a body-color roof and decklid, available lane departure warning system and forward collision alert crash-avoidance technologies, as well as GPS-enabled navigation capabilities to Chevy’s MyLink infotainment system.